Over 40% Of The Apartments Now Reserved With Just 4 One Beds Remaining! One Bedroom Apartments Available From 120,000 - 155,000! Porter Green is a sustainable development with a modern twist and derives its name from the adjacent Porter Brook riverside location and the green sedum roofs of the building and its grassed external areas. The exterior facades are mostly built of glass, metal and brick in keeping with the industrial heritage of the immediate area. With a long river frontage and a pedestrian walk on the open space to the river's edge, it truly is a beautiful place to call home. 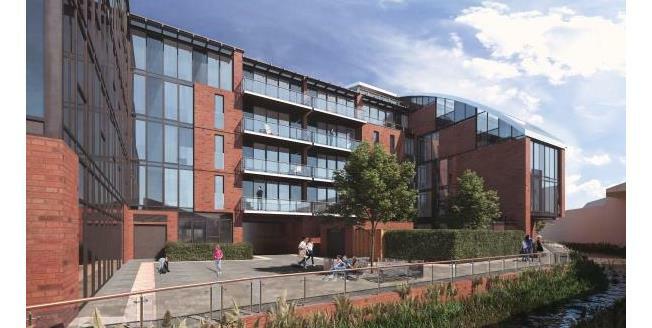 Residents will also be able to socialise on their doorstep as part of the development also holds a caf/bar adjacent to the river including a large and partly covered external terrace. Construction is due to begin this year with the first completions due in the Spring of 2020 - So if you are looking to buy off plan then now is the perfect time to get in touch for more information. There will be a range of studios, one and two bedroom apartments available in a variety of sizes. There are also Juliette balconies and terraces available on selected plots! With a 10 year build warranty by Buildzone, your new apartment will be built to a high specification and if you reserve early enough you will be able to choose from a range of colour choices to suit your own taste - and upgrades will also be available. Please ask our branch team for further information. Porter Green will be popular with a variety of buyers and demographics, yields will be perfect for an investment opportunity, or you can secure a property with a 5% deposit as Help to Buy is available on selected plots. Whether you are a seasoned buy to let landlord, a first time buyer climbing onto the first rung of the ladder or a downsizer looking for urban living then your next property may be at Porter Green. The development is located just off Sylvester Street inside the ring road, in the heart of the Cultural Industries Quarter but within walking distance of the City Centre, Hallam University and the railway station. It's also a short distance from the City ring road and therefore provides good connectivity to the motorway network and neighbouring towns. Alternatively please visit www.portergreen.co.uk to download your brochure today. Help to Buy scheme available, subject to terms and conditions. YOUR HOME IS AT RISK IF YOU DO NOT KEEP UP REPAYMENTS ON YOUR MORTGAGE OR ANY OTHER LOAN SECURED ON IT. Full terms and conditions available on request.